For our first morning swim, the first in the water was Luci. After that, chores were done well and Navigation lesson with Jess, Luci, Jerome and Jordan while everyone had a line handling lesson. Our safety officers were appointed – well done Rangi and Jess. Then Toby and Maya went through the daily engine checks with Wayne after which we had anchor up and Jess took the helm as we headed out of the harbour. We arrived at tutukaka at 1pm ready fo lunch. 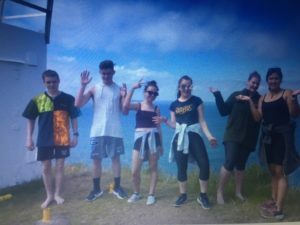 Abbey, Rangi, Jordan, Jacob, Rosa and Maya walked to the lighthouse while Kaya, Jerome, Josh, Luci, Toby and Jess went snorkelling. Everyone was back on board at 4pm after which Jacob tried doing back flips off the swing while Rangi also gave it a go. Now we waiting on dinner about to do a class. Already everyone is already very close and pretty tight friends, it’s going to be hard to get to sleep tonight from all the laughter! Have a great time Josh, make memories and friends for life.. Wonderful Enjoy Luci Thinking of you lot’s .